Often described colloquially as 3D printing, additive manufacturing is a process in which a component is built up on the basis of digital 3D design data through the depositing of material in layers. 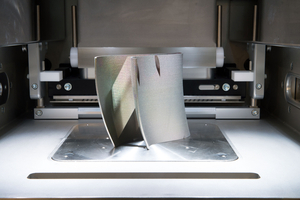 Additive manufacturing comes into its own precisely at the point where conventional manufacturing reaches its limits. In 3D printing, for example, the design defines the manufacturing – not the opposite – which means that very complex yet light, stable structures are possible. In addition to various metals, plastics and composites can also be used. When it comes to the drive technology, this type of application requires an interpolation-capable high-end controller such as Phytron's phyMOTION so that several axes can be moved at the same time and dependent on each other, allowing complex geometries to be created in space. Using the integrated circular and linear interpolation, almost any geometry required can be dynamically realised with the phyMOTION. In addition, digital and analogue inputs/outputs in the phyMOTION allow sensors to be read off and dosing equipment, for example, to be controlled. Since temperatures of up to 350°C are perfectly possible in the vicinity of the printer heads, the motors used in a system of this type also need to meet particular requirements. Phytron's ZSH-series stepper motors are not only highly precise with regard to positioning, but also cover an extra-wide temperature range. In addition, their modular design means that they can be flexibly configured. Whether combined with a low-backlash planetary gear, a holding brake for vertical axes or an encoder for position feedback, the ZSH series covers a very broad spectrum of industrial stepper motor applications. Phytron, along with its distinguished customers in this field, is looking forward to the next few exciting years when 3D printing will move out of the realm of rapid prototyping increasingly into the series manufacture of large-scale OEM.